The approach play is the low approach to the 3-5 point, See that page for alternative approach plays. The variations after are amongst the most complex known to go players. 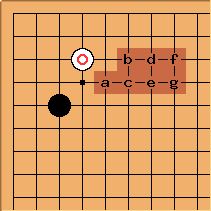 They include the taisha joseki and the 3-5 point low approach one-space low pincer, each of which ramifies into hundreds of separate lines. 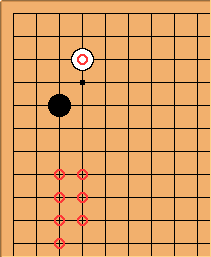 The content of these joseki is interesting, but systematic study of them can be postponed until dan level. g, the rare 3-5 point low approach three-space high pincer. 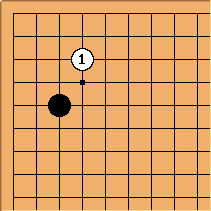 On other other hand Black can equally play on the left side, to take up position before playing aggressively. Such plays, at one of the marked points, are just as popular in pro games. Since taisha joseki games may be collected and published preferentially, it's hard to know what the figures really mean here. The press is a little too direct to be seen frequently in pro games; but probably kyu players should be familiar with it. The one-space low pincer is very good if Black already has other stones nearby (so the figures may underestimate its use).